If you are like me, you need a place of your very own to work. I think that often the woman of the house (the CEO) has an office crammed in the corner of the kitchen or laundry room. We are the masters of our homes working like clockwork. Ladies, I say we deserve more!! Forget subtle, create a bold office. Your office is your sanctuary, and a place you should love. So step things up a notch with these swoon-worthy ideas. 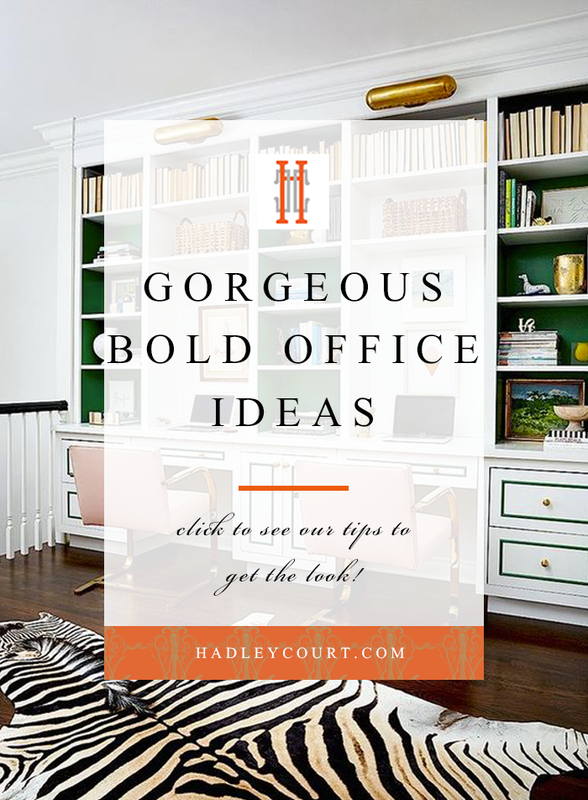 From the light fixtures to the wall colors, keep reading to see the bold office designs we are currently loving! 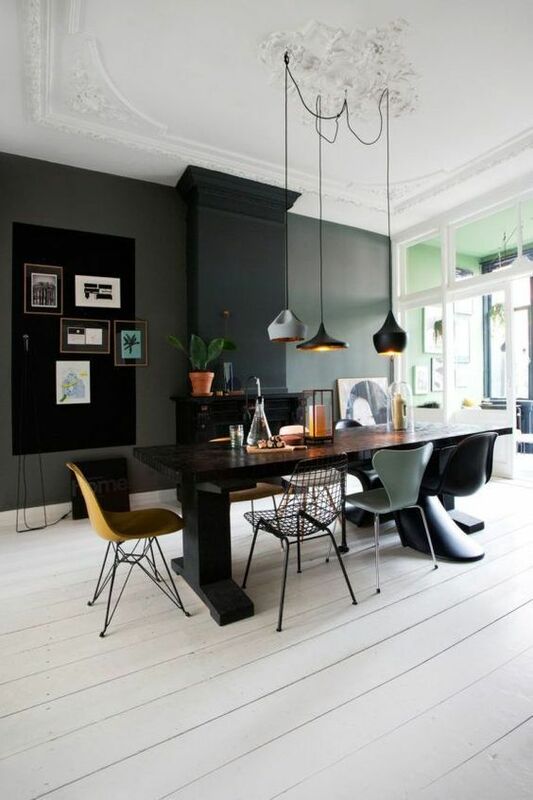 One of our favorite ways to go bold is through dark walls and an architecturally open space. Having a lighter colored, spacious floor is the perfect way to match darker decor and furniture with the dark wall colors. It allows you to implement almost any type of art and an array of trendy office decor. You can have a chic and feminine home office, while also being bold and glamorous! We love how the rich emerald color and coordinating cabinet trim adds depth to the space. Blush chairs add a light feminine touch and the zebra rug is not just fun, it’s another bold touch. Get the look by painting the back of your bookshelves with a bold, contrasting hue. An easy way to get a bold office design is to incorporate geometric shapes. 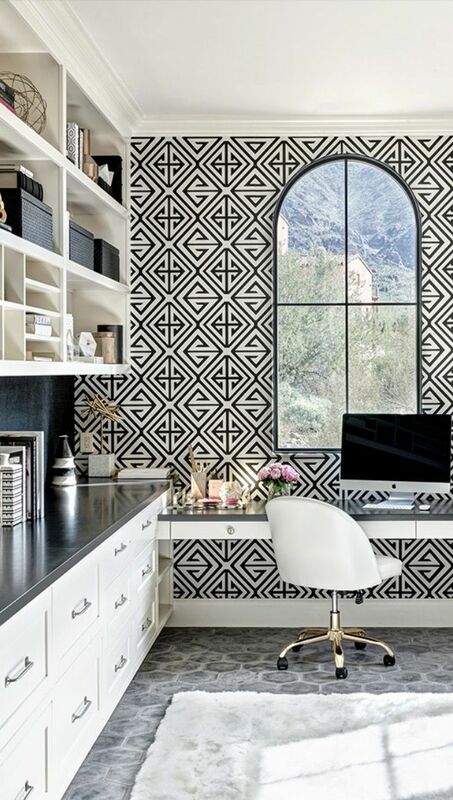 Whether you’re adding a geometric rug or wallpaper, it’s an easy way to get a bold look. If you’re doing something geometric, remember to keep the rest of your decor simple, including your furniture and accessories. Let the geometrics stand out. 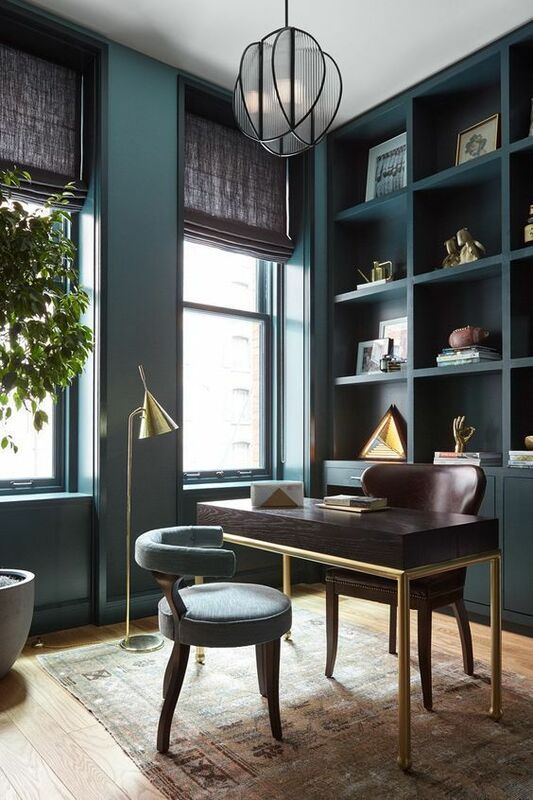 Bold doesn’t have to mean primary colors, it can also mean dark, moody tones like in this office space. We love how it’s paired with neutral tones and nature-inspired accents. Once you implement neutrals and natural elements you’re then able to include pieces with texture and patterns, giving your office the ultimate style and intimacy guests will love. The best thing about bold office designs is that the design can vary from person to person. You can have lots of color with bold metals, or you can implement nature-inspired furniture with a dark neutral paint. What are some of your favorite bold office designs? Leave them in the comment section below!